Like many of us are now, I’m craving comfort foods. Perhaps its the colder weather, perhaps its the Shady Hook tragedy, but this is a time when I’m craving comfort. And for my family, comfort = a warm bowl of fresh, homemade soup. 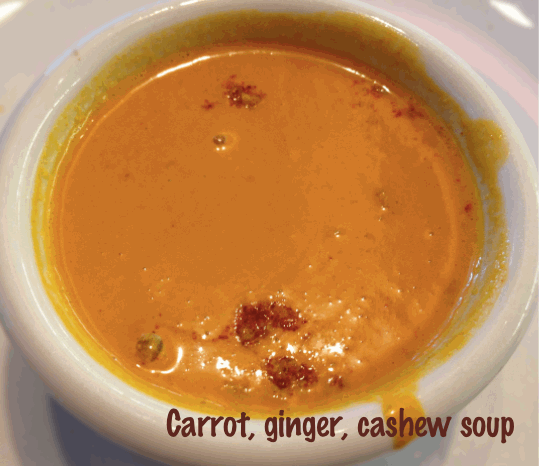 One of my fave soups is a carrot, ginger, cashew blend that’s super easy to make and is a perfect starter soup, or as a meal on its own. We tend to have a small cup of soup before our holiday meals, and while butternut squash is another favorite, this yummy carrot, ginger soup is a great alternative. For those of you who are following a raw diet, you can juice the carrots and add 1 whole avocado. Rather than sautéing the onions and spices, simply add them to the carrot juice and blend, though you may want to add pine nuts for an enhanced nutty flavor. I’ll follow this up with a full raw version, but for now, I’m sharing the cooked version as I’m craving warmth. Remember, the cashews give this a creamy base without the need for dairy, or dairy replacers, but if you’re nut sensitive you can swap out the cashews for a cup ‘or so’ of your dairy free milk of choice ( I would suggest full-fat coconut milk). I hope this simple recipe gives you some much needed warmth and comfort. Make an extra batch and share with friends and family. Give the gift of loving warmth with homemade soup. Enjoy! Place the carrots in a medium saucepan and add the water. Heat the olive oil in a small pan. Add onion and cook over medium heat until translucent. Add ginger, garlic, salt and spices. Lower the heat and continue to saute for another 8-10 minutes, until the onions are soft. Combine the spice-onion mixture with the carrots and cashews. Slowly add the water used to boil the carrots. Use a handheld immersion blender to puree the mixture until smooth, adding water as needed until you reach desired thickness. Sprinkle with crushed pecans or walnuts if desired. We made this tonight and it was a big hit! We didn’t have lemons so we left it out and I don’t know that it would have mattered since the whole family loved it without. This was the greatest soup I have ever had, not even kidding. I modified the recipe (partly by taste, partly by accident). I doubled the salt, I forgot to add the garlic, I added approx. 1 tbsp of brown sugar to the onion sauté, I used half fresh grated ginger and half pre-ground dried ginger, I used whole fennel seeds, and when I mixed the onion sauté to the drained carrots into my magic bullet (which I used to puree it) I added 2 cups of the water I used to boil the carrots into mixture to make it more “soupier” and to retain some of the nutrients lost while boiling the carrots. Love your feedback and how you made it your own! Your comment made me realize I should clarify the water usage so thank you for that – its been updated and hopefully is clearer now 🙂 glad you enjoyed it!